I chose to order the 11" model with 256GB of storage and purchased the Smart Keyboard Folio, made by Apple, specifically for this new iPad. There is no way that I’ll ever be able to fill up all ~256GB of available space, but for something this expensive, and because it’s a device I want to keep for a while, I’d rather not be continuously worried that I’m nearing its maximum storage capacity. I think it’s pretty awful that Apple is selling a Pro-series model that starts at just 64GB, given how easy it can be to run through that these days. Just this morning, I noticed that the Nest iOS app, an app that’s sole purpose is to control your thermostat, is over 230MB. Crazy! I can only imagine how much of a continued increase we’ll see in the next few years, so unfortunately, 64GB just feels too small for me, and probably, for most people. What’s wild about this device, is how small it feels, especially compared to the previous 10.5" iPad Pro. The screen fills nearly all of the available space and previously being used to having large bezels on both the top and bottom on older iPads, my brain just feels like it’s being tricked somehow. In the Apple Store, I was able to play with the 12.9" model, and like most reviewers are saying, it’s way more easy to hold now than it was before. No longer does it feel comically large, like an iPhone that’s just been scaled up. Even though I walked out of the store with the 11" model, I’m still pretty unsure if it was the right decision to not opt for the larger size. They both feel really, really nice. For my workflow, I value having a physical keyboard more than having the Apple Pencil, and because of how dang expensive the iPad Pro already is, I could only purchase one accessory. I wanted to note, though, how nice the refreshed Apple Pencil is, even though still a bit upset that they didn’t call it the “no. 2 Apple Pencil”. The new matte finish makes you wonder why the Apple Pencil ever shipped glossy. It is now less slippery, seemingly way more difficult to scratch, and just feels really nice to both hold and use. A note: to use the double tap feature, it’s not necessary to rotate the Apple Pencil so that you’re able to touch the flat side to activate the shortcut. Apple has made it possible to double tap nearly anywhere on the main surface of the Pencil for the quick tool-switching feature to work. I didn’t know about this and for an accessory this small, it’s super cool. One thing to note about FaceID, besides how well it “just works”, is that when paired with the Smart Keyboard, all you need to do to unlock the iPad is double tap the space bar. Doing this will activate FaceID, and once you’re recognized, the iPad unlocks. No need to swipe up. A small detail, but one that really makes a nice difference. Like most, I am so, so happy to see the squared-edged, industrial design come back to an iOS device (RIP iPhone 5). Everything about the exterior of the iPad feels functional and intentional. No more polished and rounded edges, which dented easily. When you hold the new model, it feels extremely similar to holding the original iPad, which launched way back in 2010. The updated physical design language really is a nice homage to that original release. 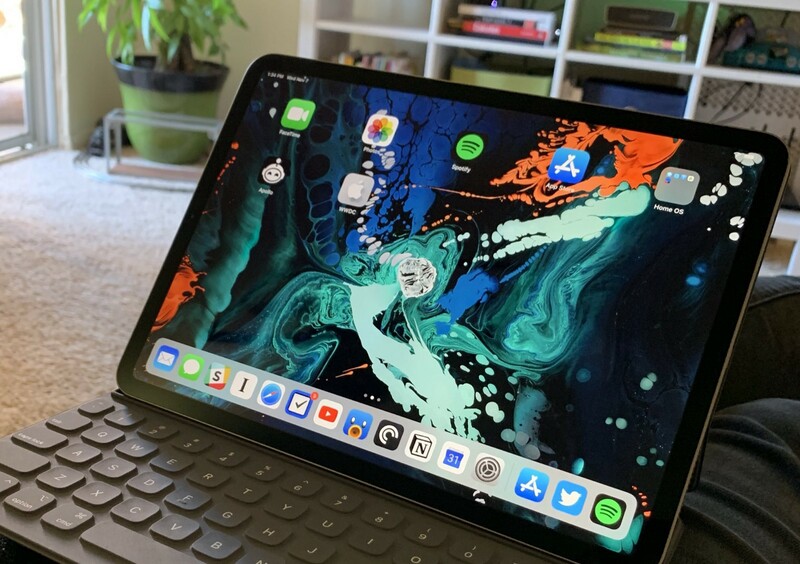 If you’re coming from a 10.5" iPad Pro, the new closer-to-the-edge screen is really nice, but the left and right bezels really are much thicker than those on the 10.5". Of course, not having the massive top and bottom chins, necessary for the inclusion of the Home Button, is wonderful, but it’s just something I noticed. It’s almost as if all four of the previous bezels were averaged and what we have now is the result. That being said, this device does feel incredibly modern, and at times, like you’re just holding a slab of glass. All of the buttons that remain are much flatter, but incredibly tactile and provide good feedback. They feel solid and have less travel when pressed as compared to the buttons on the last generation. Although this updated iPad is slightly thinner, now both sizes are at 5.9mm, reduced from 6.1mm on the previous 10.5" model, and 6.9mm on the previous 12.9" model, I think the straight edges make it difficult to believe. At least for me, the “wow”-level isn’t anywhere comparable to picking up the previous iPad Pro and comparing it to the budget 9.7" model. Not a bad thing, just something I was surprised by! The Smart Keyboard from Apple is great, but it is extremely overpriced at $179 ($199 for the 12.9” model) for an incredibly boring and lackluster product. Unlike past Smart Covers which shipped in a variety of fun, seasonal colors, the Smart Keyboard Folio comes in one color: gray. Heck, there’s not even an Apple logo on the thing. It’s vanilla. It works as advertised though and compared to the previous iteration of this product, I do like it more. Gone are the weird folds and uneven surfaces that were necessary because of how the case collapsed and it no longer feels like origami when standing it up and the additional viewing angle is really nice. I wish it had the ability to be infinitely adjustable, like the keyboard that shipped with the Pixel Slate, but it doesn’t, and no backlight, either. All of that said, I do really enjoy typing on this keyboard and am happy that it finally has the ability to protect more of the iPad, as it wraps around the back now. One additional thing worth mentioning is how smooth the cover is, unlike past Smart Keyboards and Covers. Unfortunately, there seems to be a protective coating on it, or maybe it’s a byproduct of the polyurethane, either of which I’m hoping will wear off with time, that makes it feel a bit slippery and oily. I’m excited to use this product! It feels so uniquely different and in many ways, unlike Apple, It’s possible that we’ve become so accustomed to the design language that has been a part of Apple’s hardware for years now, causing the screen’s rounded corners, or Liquid Display, and hard, straight edges to feel jarring at first, but overall, I like the direction. I’m most eager to see if and how this new aesthetic is applied to the next version of the iPhone. I’d gladly welcome more unification in appearance among Apple’s latest hardware. 👋 Thanks for reading! If you want to hear more thoughts on the iPad Pro, or on design as it relates to healthcare, find me on Twitter! Would love to say hello.